Has the place where Jesus was sentenced to death been discovered? Pilate washes his hands of the decision to execute Jesus. [by Dean Smith] According to an article in the Washington Post, archaeologists may have discovered the very place where Pilate sentenced Jesus to die on the cross. Fifteen years ago, while working in a building beside the Tower of David Museum, archaeologists discovered a massive structure below the floor boards of the building which had originally served as a prison for the Ottomans and as well the British during the 1940s. As they continued their work, they uncovered what is now believed to be the remains of Herod’s massive palace — including its walls and sewage system. It is generally agreed that Herod’s palace was located on the western side of Old Jerusalem, putting it near the Tower of David museum. During their excavation, they also discovered an area near a gate with an uneven stone floor. This fits the description in the Gospel of John of the place where Pilate sentenced Jesus to die by crucifixion. To avoid becoming unclean, the Jews refused to enter the building preferring to stay in the court yard. Pilate took Jesus into the Praetorium for questioning and then would go back outside to talk to the priests. This back and forth discussion happened a number of times. 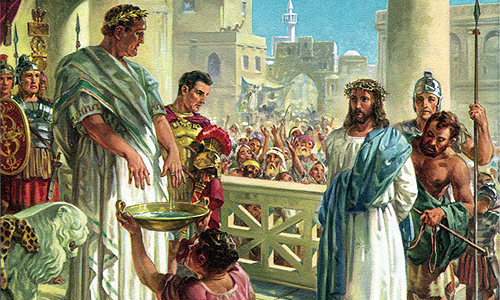 During these deliberations, Pilate realized there was not enough evidence to convict Christ. Pilate went outside to negotiate Jesus’ release with the Jews, as it was customary for the Romans to release a prisoner before the Passover. However, the Jewish leaders demanded the release of Barabbas instead. With the crowd clamoring for Jesus’ head, Pilate washed his hands of the situation and sentenced Jesus to die on the cross. Pilate used his judgement seat for the sentencing. It is basically a seat on a raised platform. It was located in a place called “Gabbatha” which described the paving rocks that covered the floor. It was outside the main building and by implication near a gate and probably where the Jewish leaders had gathered. However, there has been some debate over whether the sentencing took place at Herod’s palace or the Roman barracks at the Antonia Fortress, which also has stone flooring. The reason for this is because the Apostle John used the word Praetorian to describe the location. Praetorium is a Latin word used for the tent or headquarters of a Roman general, making the fortress a strong consideration. When choosing a location for their headquarters, it seems the Roman leadership preferred Herod’s luxurious palaces over austere Roman barracks. The recent discovery of the stone flooring at Herod’s palace would solidify it as the leading contender for the location of Christ’s sentencing.